The media – your summer thriller? 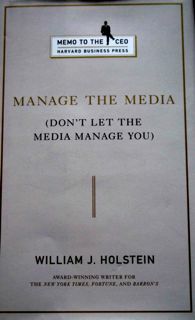 Here’s a summer reading idea, since we have a few weeks left, maybe with some pool or beach time: Manage the Media (Don’t Let the Media Manage You) by journalist William Holstein. It’s a quick, easy read in the Harvard Business School Press “Memo to the CEO” series: 100 pages, with many anecdotes and a real-life point of view. Even if your job in investor relations excludes dealing with the media, this little tome offers valuable insights, so think outside the silo. Sooner or later today’s headlines on executive pay, shareholder activism, CEO missteps and other topics may come home to roost – and as an IRO you will have input into how your company communicates in a crisis. A little forethought now may help avert a nightmare later. In response to the rapid emergence of coalitions of critics, shareholders and investors, and in recognition of the increasing prevalence of Internet-based communications, there appears to be growing consensus … that the broad role of communications must be more deeply integrated into how CEOs chart their business strategy. Communications can no longer be a sideshow. Media relations also caught the attention of NIRI in the July issue of Investor Relations Update – worth a peak if you haven’t read the article. Not that a CEO, VP of public relations or IRO can really “manage” the media. Giving up that illusion is the first step toward successfully working with the media. What Holstein presents is a practical set of suggestions for how companies can manage themselves to communicate more effectively. This entry was posted on August 5, 2008 at 5:51 pm and is filed under Career development, Media & public relations. You can follow any responses to this entry through the RSS 2.0 feed. You can leave a response, or trackback from your own site.